Stuart Hall offers an accessible and clarifying analysis of the social construction of race and racial difference. He explores how variations in people's appearances come to be mistaken for essential differences. He traces how these misinterpretations function both to express and to reproduce dominant power relations. And he argues for more rigorous engagements with identity, representation, and contingency capable of acknowledging and respecting difference without essentializing it. An ideal introduction to how cultural studies intervenes in debates about race, representation, identity, and power. DVD extra: The Reference Edition features, unedited, the full lecture that Hall delivered at Goldsmith's College in London (65 min), as well as the 20-min question-and-answer session that followed. Sections: Intro | What More Is There To Say About Race? | The Formal Rejection of Biological Racism | The Survival of Biological Thinking | The Badge of Race | Race as a Language, a Floating Signifier | But What About the Reality of Racial Discrimination & Violence? | Two Positions: The Realist and the Textual | A Third Position | The Discursive | Religion | Sleeping Easier | Fixing Difference | Nature = Culture | Seeing Is Believing | Genetics | Reading the Body | Why We Have To Move Beyond Reality | Analyzing the Stories of the Body | Why Does it Matter? 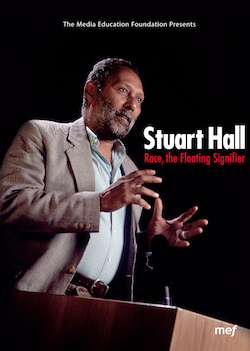 Stuart Hall, a leading figure of the British left over the past thirty years and a visionary race theorist, had made profound contributions to the field of cultural studies at the Center for Contemporary Cultural Studies at Birmingham University. His work has made possible multiple conversations taking place around questions of culture, race and ethnicity.